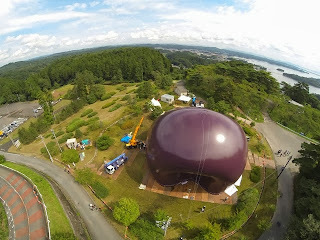 An inflatable purple concert hall is set to embark on a tour of Japan, beginning with one of the country's most devastated areas. The mobile structure, known as Ark Nova, was designed by British sculptor Anish Kapoor and Japanese architect Arata Isozaki, and will host its inaugural event on October 12th in Matsushima — a coastal town in northeast Japan that was ravaged by a 2011 earthquake and tsunami. Ark Nova was created with support from the Switzerland-based Lucerne Festival, and will host musical performances from international orchestras, as well as traditional Japanese concerts. 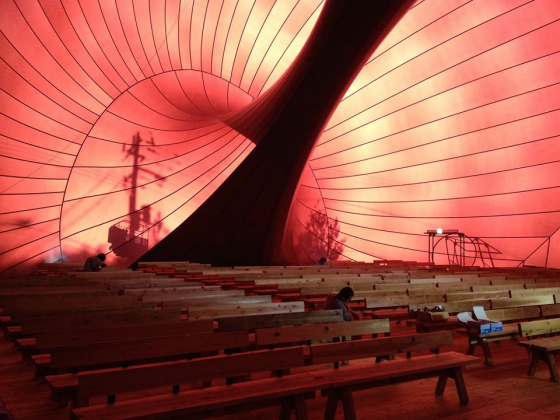 Widely referred to as the world's first inflatable concert hall, the structure consists of a large purple membrane that can be quickly inflated and deflated for easy transportation, and can accommodate up to 700 people. Wood from cedar trees at a local temple in Matsushima were also used in the hall's seats and acoustic materials (the town is known for its cedar tree islands). "We felt that the site in Matsushima, amidst the destruction of the tsunami, needed a temporary structure and an inflatable seemed to be appropriate," Kapoor told theTelegraph. Michael Haefliger, artistic and executive director of the Lucerne Festival, said he sees the project as a way of providing joy to people who suffered so terribly two years ago. The Tōhoku earthquake and tsunami killed more than 15,000 people across Japan when it struck on March 11th, 2011, wreaking havoc on the country's economy and nuclear facilities. "With the Lucerne Festival Ark Nova Project we hope to give the people who are living with this situation something more than everyday pleasure," Haefliger said. "Combining different arts and cultures, this project is a fascinating symbiosis of architecture, design, folkloristic and classical music as well as music education."